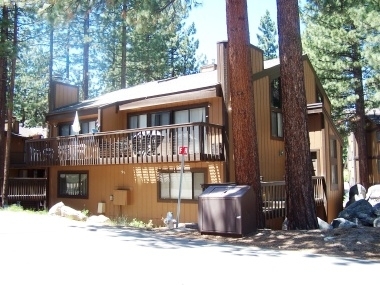 This spacious and newly remodeled town home backs up to the forest for privacy. From the master bedroom with the king-size bed, CTV and rock fireplace, to the spacious living room with hardwood floors, this condo has it all. The downstairs area has a queen bed in one room, and two twin beds in the other. There are many windows throughout, and high ceilings making this condo light and airy. The kitchen is fully equipped and opens up to the living room. The living room has a corner fireplace and big screen CTV, outside decks equipped with gas barbeque and lots of privacy. This property is perfect for family and friends to come together! Less than five minutes driving to downtown casinos, restaurants, and beaches. Full use of heated swimming pool 'in season', tennis courts, his and hers sauna, outdoor hot tub and barbeque area. Four wheel drive or chains required in winter.